Nigeria’s Senate President, Bukola Saraki, faces arguably one of the toughest battles of his political career ahead of the forthcoming 2019 general elections, and analysts predict his relevance in Nigerian politics after the polls will be determinative of how well he gets over the hump. A war against years of ineffective governance or revolt against an age-long dynasty? Nigeria holds its general elections in a few weeks and Senate President, Bukola Saraki many hurdles to contend with in Kwara State; his country home which has hitherto been his political fortress. For the first time in his political career, the Nigeria Senate President will partake in an election in which his chances of winning are the same with that of losing. 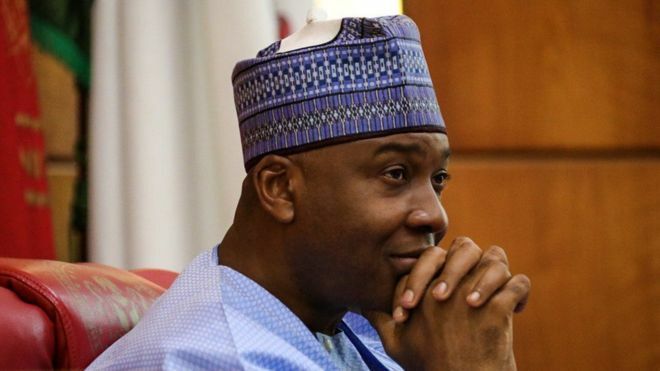 Findings by CARACAL REPORTS across the state show that the forthcoming general elections will not be business as usual for Saraki in Kwara State, where he has maintained absolute political control over the years. The slogan, sponsored mainly by the All Progressives Congress (APC)- the main opposition party in the state- is indicative of a sweeping movement across the nooks and crannies of the state to oust the Saraki’s age-long dynasty in the North Central state of Nigeria. The Saraki family has dominated the politics of the 51-year old Kwara State from their fortress in Ilorin, the capital and seat of power for many years. They-overtly and covertly decide who gets what in the state and how whatever that is accrued to the state at the federal level is being spent. Until a recent by-election where the Senate President’s party, the Peoples Democratic Party (PDP) lost out in an election, the Sarakis have won every election held in the state under three different parties since 1999. But that is only a fragment of the Senate president family’s political dominance in the state, which stretches backward. Of the six governors the state has elected since 1979, only one was not handpicked by a Saraki. Even in that odd case in 1983, Cornelius Adebayo of the defunct Unity Party of Nigeria got a helping hand from Abubakar Olusola Saraki, father of Nigeria’s Senate President. Analysts believe the Sarakis dynasty in Kwara Politics owed largely to their ability to forecast political weather in the country, and such submissions are tenable, given the fact that such instinct has always enabled them to enjoy massive federal might. However, it seems the tide is gradually turning in the state and it is increasingly becoming glaring that the forthcoming elections would not go the way of history for the Sarakis, especially with strong opposition in place. It is unarguable that the Sarakis’ age-long dynasty in Kwara state owes much to their ability to nullify formation of strong opposition. The emergence of strong opposition, therefore, signposts a major threat to the family’s political grip over the State’s politics. For instance, APC, the major opposition party in the state grounded out a shock victory during last year’s bye-election in Kwara South Senatorial district- which is the first time the Senate President would suffer defeat to an opposition party in the Kwara. The by-election had been held to fill the void left by Hon. Funke Adedoyin a member representing Irepodun/Isin/Ekiti/Oke-Ero Federal Constituency at the House of Representatives having died shortly after she decamped with Saraki from APC to PDP. At the end of the highly-staked by-elections, the candidate of the APC, Tunji Olawuyi was returned as the winner. According to the Independent National Electoral Commission, INEC, the APC’s Olawuyi polled 21, 236 votes to defeat his main challenger at the poll, PDP’s Shaheed Alatise, who garnered 18, 095 votes. “The political tension in Kwara state right now is high and the reason for that is because, before now, the political opposition in the state has not been this strong,” says Mr. Afolabi Abdusalam, a topnotch political analyst in the state during a chat with CARACAL REPORTS. Political commentators in the state argue that while PDP’s loss at the bye-elections does not undermine the party’s popularity and influence in the state, it nonetheless signals what to expect ahead of the forthcoming general elections. “It will be baseless to predict the outcome of the forthcoming elections in Kwara State based on the outcome of the recently concluded bye-election,” Mr. Wasiu Adegboye another political pundit in the state in a chat with CARACAL REPORTS. “If you look critically at the situation on the ground, the only condition that could make APC win elections in Kwara State over Saraki’s-led PDP is the clamor for an end to his family’s dynasty. Otherwise, no one can predict the outcome of the election. For those predicting an easy victory for APC, what structure does the party have in the State?” he asked. Pundits believe PDP’s major strength in the Kwara State rests on its storied political structure, built over the years, particularly in Ilorin. “I don’t think it will be so easy for the APC to take over power from PDP in Kwara State because of the Sarakis political structure, though anything can happen,” says Mr. Abdusalam. To some analysts, the current situation is caused by the fact that Saraki had deviated a bit from the laid structure. “The issue is that the Senate President, out of pride, has deviated a bit from the fundamental political structure laid by his father” argues Mr. Adegboye. The APC would be relying heavily on federal might and its recent unexpected victory at the bye-elections to defeat Saraki-led PDP at the polls. “So, APC will likely do everything to win the election in Kwara State just as it did in Osun State,” he observed. The Senate President needs no introduction when it comes to navigating the murky waters of Nigerian politics. The manner in which he comprehensively toppled his father’s political influence in the state during the 2011 elections is still fresh in the minds of many. His ability to weather the storms that trailed his emergence as Nigerian President against the wish of APC who had preferred, Senator Ahmad Lawan and consequently retained the position against the odds, especially after his defection back to PDP from APC shows his political doggedness. Some commentators believe such experience remains his major strength for victory at the forthcoming elections, which will test his popularity and political relevance. As the 2019 elections continue to garner momentum, time will tell where the pendulum of the Senate President would swing, especially given the fact he’ll be running the race squarely on his own.